New in MusicMaster 5: Printing Options - by Aaron Taylor – WELCOME TO OUR INTERNATIONAL SUPPORT! Here are a couple of new printing design options that are now available to users in MusicMaster 5.0 that may be helpful to you. Under DATASET-SCHEDULE-PRINT THE LOGS, you now have the option to create separate files and filenames for each day of logs you wish to print. This could be very helpful if you are generating these logs as a .pdf (get in touch with your MSC if you’d like to learn more about how this is done…) For example, perhaps you’re tasked with sending emails daily to an off-site voice tracker. 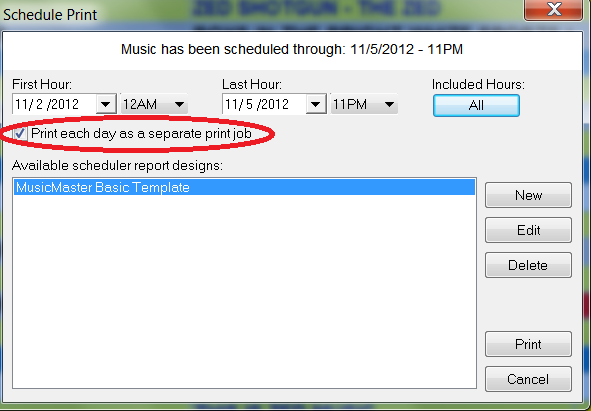 You’ll want to select the check box for “Print each day as a separate print job”. You will be prompted to create a filename for each date you wish to create a separate file for. 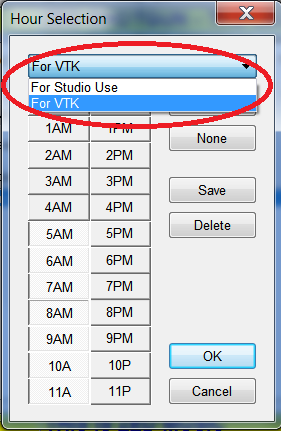 Another new functionality in this same area of the application is the option to save up to ten sets of hour groupings. You have the option to save hour print groupings with a title that you specify. As shown in the example below, perhaps you’d desire to create a print grouping for paper logs to be printed for in studio usage, as well as a grouping for the hours that your talent will be voice tracking in a production studio.